I am designing a PCB with RF (~3 GHz), analog/mixed-signal (ADC, DDS) and some high speed digital lines (ADC outputs, DDS input; ~100 MHz). There are very few RF lines which I can have on one layer. But digital may be more which I need to route in different layers. I decided to use just one single ground (due to added complexity, issues with return currents and questionable benefits). On the PCB I use 6 supplies all over the place (1V, 1.2V, +/-3.3V, +/-5V ... and also 2.5V and 1.8V but they are more localized). My previous prototype was 4 layer and for that the one "correct" way was: 1 - important signals, 2 - Ground plane, 3 - supply plane (all supplies on same layer), 4 - less important signals. Now I want to upgrade to 6 or 8 layers (cost is secondary). Assuming 8 layers bring signifiant benefits - what is the best stackup? Signal: Less important stuff, high speed digital (short lines). Disadvantages: -5V/-3.3V no closeby ground, high speed digital couples into supplies, Layer 1+8 problematic for high speed digital since no ground plane. Many possible combinations are possible but none of them seems really too great. Ideally I would have 20 layers and separate each layer by ground. But since this is not possible with 8 (this is about max for me) - maybe better start off with 6? For all options, I would create a polygon pour to GND net on all signal layers where there is no signal routing to add additional grounding. The general idea is there exists capacitance between layers, decreasing the height (or distance between layers) increases this capacitance. 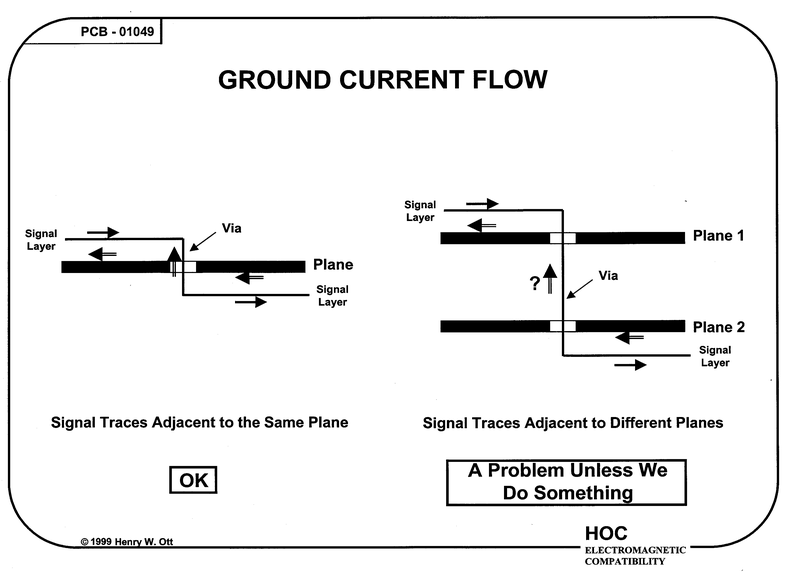 The second thing to worry about is the return current, the closer these currents are the lower the inductance. This shows below the return currents, keep in mind that adding vias also increases inductance, which will limit the high speed or RF capability. By placing the signal and RF layers close to a ground, the easier it is going to design transmission lines, and the less impedance any trace will have. The Prepeg layers can lower capacitance even more and allow for even lower impedance (faster speed) traces. With high speed digital the first option is going to be a problem especially with the top layer, the second one is much better. Not the answer you're looking for? 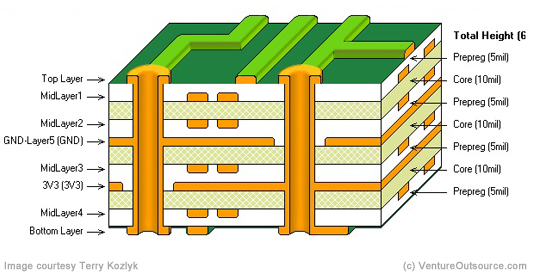 Browse other questions tagged pcb pcb-design pcb-layers or ask your own question. High-Speed PCB Design - Routing on Power Plane Layer? are there any differences between referencing signal to VCC or GND planes? PCB design - Ground fill on every layer? Are Gerber files of inner layers interchangeable?